Nose: Creamy caramel fudge, vanilla sponge cake with a dusting of icing sugar, uncooked cookie dough, fresh malt, and lemon lollies. Also a slight note of what you get at the back of your nose when you get dumped by the surf. Quite the summer holiday at the beach on the nose of this one. Barely any peat coming though, despite knowing full well what is in the glass. Palate: Both peat and caramel hit first – quite a soft and sweet peat; trundling alongside a rich dark caramel toffee. There’s also some buttercake drizzled with honey, a bit of fresh malt, and notes of fresh strewn hay. Those lemon lollies from the nose also make an appearance, right at the back along with some dried fruits such as apples and pears. Strangely salty, yet still quite sweet. Also some notes of honeydew melon and the faintest of hints of stone fruits. There are so many layers to this one – I could roll it round my tongue for weeks. Mouthfeel: Not the thickest of Octomores, but so silky smooth. Neither oily or dry, and not a hint of burn. Finish: Not the brashest of finishes – particularly for an Octomore; in fact many of the notes disappear quite quickly. Notes of salty vanilla and caramel hang around for quite some time on the tongue – with such sweet sweet peat sitting comfortably at the back of the throat for an age. Wow – just amazing. I’ve now drunk this whisky about 7 or 8 times, and I still need a seat so nobody notices when my knees buckle underneath me. No kidding – this whisky is that good. I’m going to stick my neck on the line with this statement: this is the equal greatest whisky that I have ever had. Although completely different whiskies, I personally rate the Octomore 7.3 equal to the one whisky that I have for years held above all others, the Octomore 2.2. 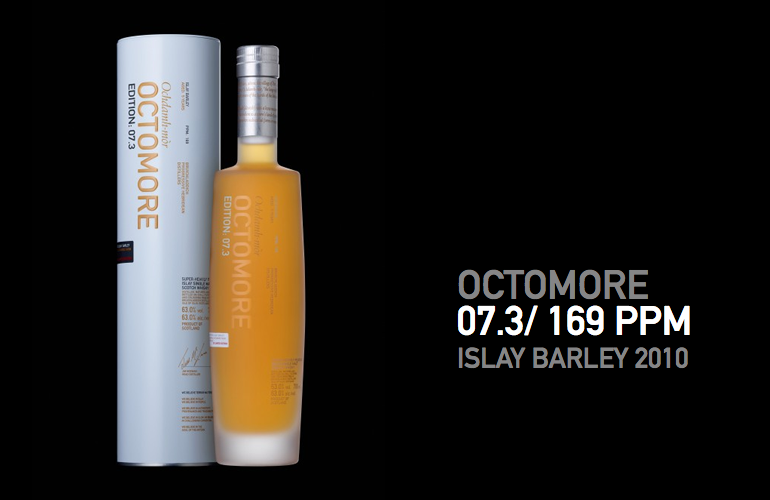 As Bruichladdich put it themselves, Octomore 7.3 is the second Octomore of Octomore. The barley for this whisky was grown in Lorgba field in James Brown’s Octomore farm on Islay. It was harvested, malted, and peated to 169ppm in 2010; before being bottled at 5 years of age at 63%ABV with no colouring, and no chill-filtration. Octomore 7.3 was aged in a combination of ex-Bourbon casks and ex-Spanish wine casks from Ribera del Duero. Octomore 7.3 is a whisky that really epitomises everything that the modern Bruichladdich stands for – pushing the boundaries of whisky production with peating the malt to spectacular levels, and focusing on the providence/terroir at a level almost never seen with Scotch whisky – right down to not just which farm, but also which field the barley comes from. If you haven’t yet tried some Octomore 7.3 – I highly recommend you find some (or lots – I have several bottles, so buy as much as you can get your hands on 😛 ) and give it a go!